Our user-programmable low voltage disconnect (LVD) circuit remains one of our most popular products – very useful to protect batteries from deep discharge damage. One request we have received many times is for an LCD (liquid crystal display) to be added to our low voltage disconnect circuits so that the actual voltage of the battery being monitored is shown together with other useful information such as the low voltage disconnect set point, state of the system, and so on. 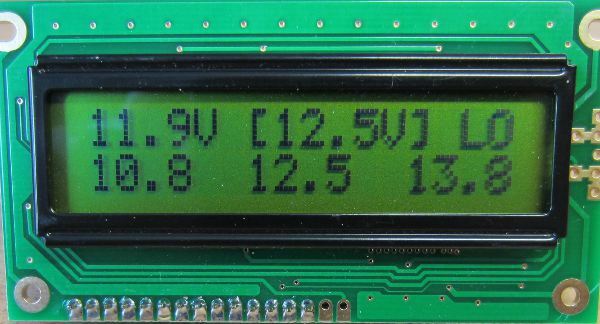 A second request is for some datalogging of the voltages measured – ideally to be displayed on an LCD. Therefore we have developed a new REUK low voltage disconnect circuit with LCD and data logger to meet both of those requirements. We have attempted to make this device as useful as possible while being as simple as possible to use. 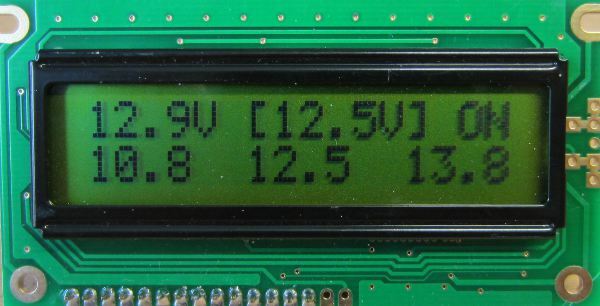 The LCD pictured above from our prototype shows (from top left to top right) the current voltage measurement (updated every 0.1 seconds), the target voltage for change of state (in this example 12.5V is the voltage below which the low voltage disconnect will engage), and the state (in this case, output ON). The bottom row shows the data from the data logger, from left to right, minimum voltage logged, average (arithmetic mean) voltage logged, and maximum voltage logged. The voltage measured is logged once every just over 7 minutes, with the most recent 200 measurements logged. That gives a 24 hour record of the battery voltage which is very useful for identifying problems and understanding battery usage. In the screenshot above, the state is now ‘LO’ since the measured voltage (11.9V) is below the LVD voltage (12.5V). After 10 seconds of this state being maintained, the output would be turned off automatically and only turn back on after 10 seconds of the measured voltage exceeding the LVD cancellation voltage. The user can easily set the disconnect voltage and cancellation voltage using the display and a button on the LVD circuit, and the datalog can also be cleared by the user. All data is retained by this LVD circuit even when it is disconnected from the battery. If you are interested in purchasing a low voltage disconnect circuit with display and datalogger, email neil@reuk.co.uk with details of your exact requirements.